Gloucester Township, Camden County, NJ – Gloucester Township needed improved water for Wells 14 and 15 and CES provided the solution. CES designed the equipment containment buildings and coordinated with the radium removal contractor regarding all design aspects, such that the new radionuclide removal system and existing IPMP Filter/Treatment System installed in the proposed treatment buildings. CES coordinated and designed the necessary treatment, electrical, and instrumentation systems. CES and WRT coordinated with Aqua NJ the exact SCADA system requirements. The design included hardware requirements for the SCADA system as well as the I/O wiring required to and from the various field devices. CES performed an hydraulic review of the well pumps and the pressure drops from each system and recommended pump upgrades accordingly. 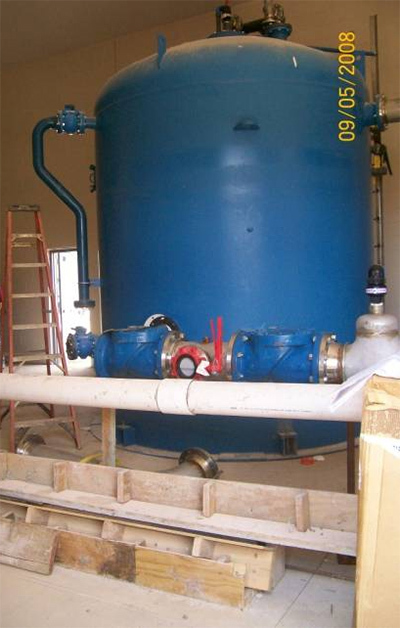 We also provided all contract documentation and drawings for bidding purposes, and provided construction management services for both treatment plants. The building design consisted of a split faced masonry wall with masonry “A” frame wood roof construction.